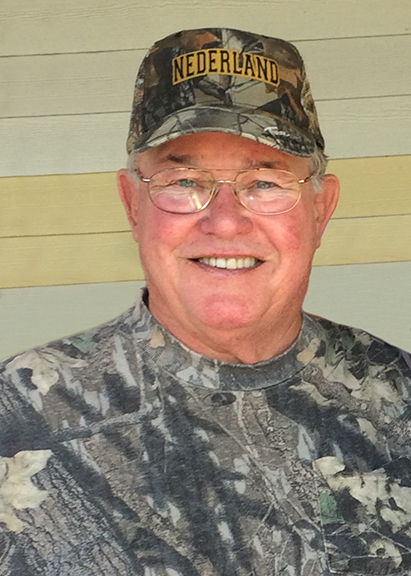 Buddy Joe Harber, 73, of Nederland, passed away peacefully on Friday, October 5, 2018. Joe was born on October 18, 1944, to the late Marie and Charlie Harber, formerly of Lufkin, Texas. Joe was a graduate of Corrigan High School. He enlisted in the Navy in 1966 and was stationed aboard the USS Hancock in San Francisco, California. In 1970, he left the Navy to pursue a career in law enforcement as a Texas DPS Officer where he served Jefferson County for ten years. Joe married the love of his life, Connie, in 1972. Following his service in law enforcement, he went to work for Rutherford Oil Company where he worked for twenty-nine years as a field supervisor until his retirement in 2010. Joe was an avid Bulldog fan, loving friend, and hard worker. After retirement you could find him in his garage doing what he loved, wood working. Survivors include his son, Bubba Harber and his wife, Jessica; and his two greatest gifts, his grandchildren, Chad Allan Harber and Charlee Paige Harber. Joe will be greatly missed. He is preceded in death by his parents, Charlie and Marie Harber; son, Chad M. Harber; and his loving wife, Connie. A gathering of Mr. Harber’s family and friends will be from 5:00 p.m. until 8:00 p.m., Monday, October 8, 2018, at Broussard’s, 505 North 12th Street, Nederland. His funeral service will be 11:00 a.m., Tuesday, October 9, 2018, at Broussard’s, with interment to follow at Oak Bluff Memorial Park, Port Neches. Memorial contributions may be made to Nederland Little League, P.O. Box 2188, Nederland, Texas 77627. My sympathy goes to all of you during this time of grief. Although “time and unforeseen occurrences affect us all, even death, we have Jesus’ promise that our dead ones can live again. Eccl 9:11; John 6:40. For more comfort please visit our website: jw.org and view the faith strengthening video: Is There Hope for the Dead? ? We send our love and prayers to all of you in your time of loss. Joe will truly be missed. So sorry to hear of Joe's passing. Joe and I went thru the DPS Academy together, then were stationed in Lufkin together and again stationed together in Nederland. He was a good friend and an even better man. I pray for comfort for the family. Just heard the sad news of Buddy's passing,we very sorry to hear about him,we graduated high school together, he was always such a nice guy,my deepest condolences to you and family. Bubba, sorry for your loss. Your dad was a great man.